VERY FINE. 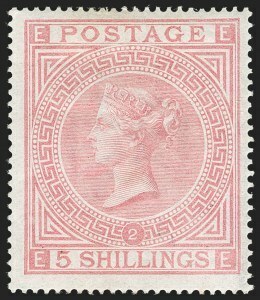 A FRESH EXAMPLE OF THE 1867 5-SHILLING ROSE FROM PLATE 1. 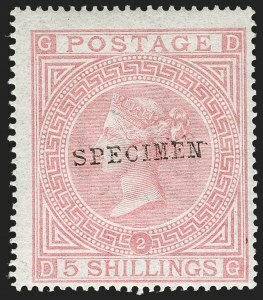 AN UNCOMMON STAMP IN THIS PREMIUM CONDITION. This issue is notoriously poorly centered, with this example far bettered centered than most. Ex Baillie. With 1996 B.P.A. certificate. SG £11,000. Scott $11,000.00. 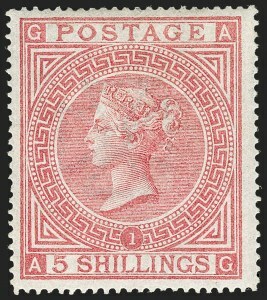 VERY FINE EXAMPLE OF THE 5-SHILLING PALE ROSE FROM PLATE 2. 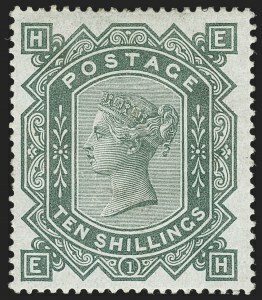 Printed about seven years after Plate 1, examples from the Plate 2 printing are equally as scarce, if not more so, in sound and original-gum condition. With 1985 B.P.A. certificate. SG £18,000. Scott $17,500.00. 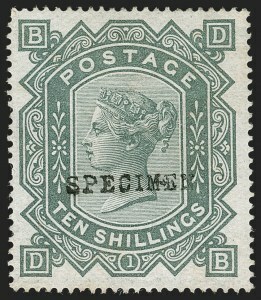 VERY FINE EXAMPLE OF THIS IMMENSE GREAT BRITAIN RARITY -- THE 1878 10-SHILLING GREENISH GREY. EASILY ONE OF THE FINEST OF THE ORIGINAL-GUM EXAMPLES KNOWN. While used examples are available, original-gum examples are rarely encountered. When offered unused copies are offered, they invariably have major faults, including repairs and/or regumming. This is the first example we have offered unused, in any condition, since keeping computerized records. Ex Baillie. With 1986 B.P.A. certificate. SG £60,000. Scott $60,000.00. 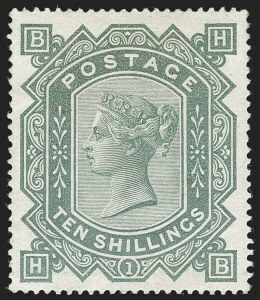 VERY FINE AND MARVELOUSLY SUPERB EXAMPLE OF THE 1883 10-SHILLING ON BLUISH PAPER. 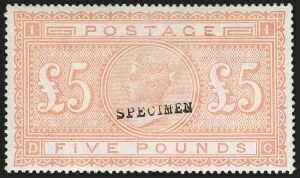 ONE OF THE RAREST REGULARLY ISSUED UNUSED STAMPS OF GREAT BRITAIN -- MISSING FROM EVEN THE MOST ADVANCED COLLECTIONS. As written in Wiseman, the Post Office circular of Sep. 26, 1878, coinciding with the release of the first 10sh (SG 128), stated "Postmasters are requested to use them as far as possible in denoting the charges for unpaid postage etc. on Head Office letter bill dockets..." Therefore, at the time of issue, there was no regular postal need for stamps of this high denomination. Other than serving as postage due stamps on the letter bill dockets, these ultimately came to be used for bulk mailing in 1883. Reports also show that this stamp was supplied only to the major post offices and not widely circulated. It is obvious from these circumstances that very few unused examples were saved for stamp collectors. Ex Dale and Baillie. With 1955 R.P.S. and 1991 B.P.A. certificates. SG £135,000. Scott $135,000.00. VERY FINE. 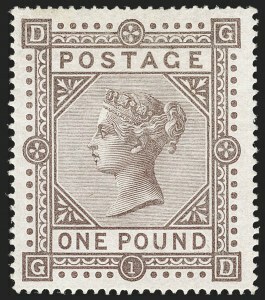 AN EXCEPTIONALLY CHOICE ORIGINAL-GUM EXAMPLE OF THE ICONIC AND RARE 1878 ONE-POUND BROWN LILAC. EASILY ONE OF THE FINEST AMONG THE MINUTE NUMBER THAT EXIST IN SOUND ORIGINAL-GUM CONDITION. 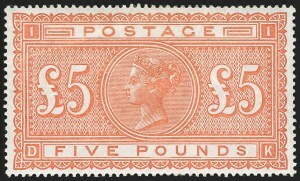 This is a key stamp for even the most advanced Great Britain collection and in condition that would satisfy the most fastidious collector. Ex Baillie. With 1987 B.P.A. certificate. SG £90,000. Scott $90,000.00. EXTREMELY FINE GEM. 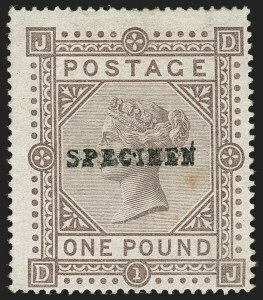 AN IMPECCABLE SOUND ORIGINAL-GUM EXAMPLE OF THE 1882 ONE-POUND BROWN LILAC ON BLUED PAPER. A MONUMENTAL RARITY AND ONE OF THE HIGHLIGHTS OF THE DIMITRIS BERTSIMAS COLLECTION OF GREAT BRITAIN. WITHOUT QUESTION, THE FINEST EXAMPLE KNOWN -- COMBINING CENTERING, COLOR AND OVERALL FRESHNESS. 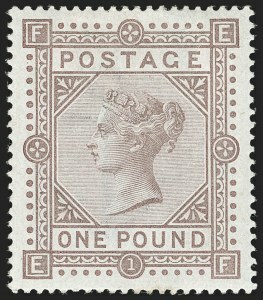 Three fundamental circumstances explain the great rarity of original-gum examples of Great Britain’s classic high-denomination stamps. First, there was an underlying lack of postal necessity, since Parcel Post service was not available until 1883; therefore, the high values were generally used as postage due stamps on letter bill dockets. Second, large denominations were only circulated to post offices in major cities. Third, stamp collecting was just beginning to gain popularity, and few collectors or dealers had the means to invest heavily in the higher denominations -- a sterling pound was a significant sum of money to spend on one stamp. Our exhaustive search of famous name auction sales spanning decades reveals few unused examples in any condition. In total, it is believed that no more than 20-30 examples exist in original-gum condition. Very few are completely sound and well-centered. In fact, we could not locate another stamp of the quality of the example offered here. Ex Gross. With 1994 B.P.A. certificate. SG £175,000. Scott $155,000.00. VERY FINE. A WONDERFULLY CHOICE EXAMPLE OF THIS POPULAR 1882 5-POUND HIGH VALUE. Ex Alcock and Baillie. With 1974 B.P.A. certificate. SG £14,500. Scott $14,000.00. 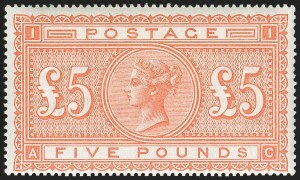 VERY FINE APPEARING EXAMPLE OF THE 1882 5-POUND ORANGE.